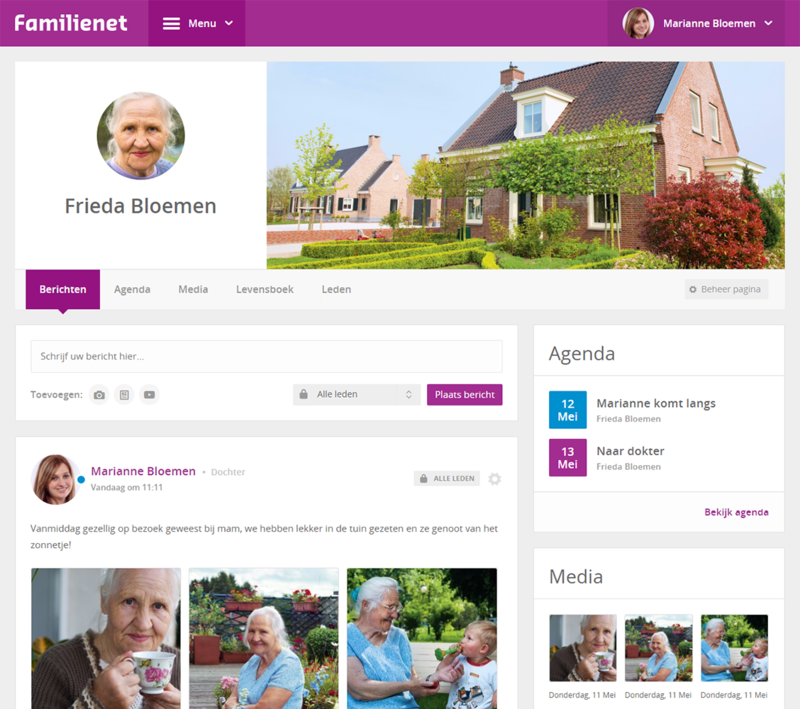 Familynet allows you to organise the care for a family member in a convenient and fun way. On a personal and secured page you make appointments together, you share beautiful moments and save memories. Familynet is a personal, secured page that is accessible only to those appointed by you. On this page, you can communicate 24/7. Familynet Home is easy to use and accessible on your PC, smartphone and tablet. This way, you are always informed as a family. Posting messages on the personal page is fast and easy. You may want to post something about a visit or another event, for instance. This allows all family members to keep each other updated. You can also add photos, videos or documents. The clear calendar allows members of the personal page to share appointments and tasks. When does mum have to go to the doctor? Will the physiotherapist be coming around soon? Or you can assign visits among you, so there is someone there on a regular basis. A convenient tool for sharing care and important moments. The unique Familynet Lifebook is a magnificent document, created by you and the rest of the family, about the principal person's life. Share photos, memories, videos, important events, music and more ... Everyone can contribute and view the result. It is possible to grant care professionals access to Familynet. This will improve communications with regard to the family member. The care professional can simply share updates and family members can simply ask questions. This takes place in a personal environment, enabling everyone to see exactly what is needed. This means the care professional does not see everything automatically. We have made sure that Familynet can be accessed on various devices. The personal page can be accessed on the PC, but also on your smartphone and tablet. This makes it even easier to quickly share messages and other matters on the personal page. Familynet is safe and reliable. We attach great value to privacy. Users have to log in with an e-mail address and password and the website is secured with an SSL certificate. Data is stored at a reliable party. This party holds ISO 27001 and NEN 7510 certificates. The information you share on Familynet remains available to you for as long as the page exists and is also easily exported. Familynet does not use advertising and will not do so in the future either. We never share data with third parties. This sets us apart from a lot of popular social media platforms such as Facebook and Whatsapp. This is a fixed amount for the page. You can add as many users to this page as you want. There is no limit to the number of messages, photos, videos or documents either. This means it is all very transparent. Why do you have to pay for Familynet? We work very hard every day in order to improve and continue to develop Familynet. And as mentioned earlier: we do not use advertising. Paying users are our only source of income. We intentionally keep costs low in order to keep Familynet accessible for everyone. Want to find out? Try out for yourself now and find out how easy it is to use Familynet. We are happy to offer you a free 14-day trial subscription, which will end automatically. Then you decide if you want to take out a paid subscription.